Biscottificio Domenica Caucci, a biscuit factory at Trecchina, in the beautiful mountain scenery in the South-West of Basilicata, has operated for over thirty years in the field of typical regional baked products, and represents a family business which passionately cherishes local tradition at the highest quality level, with the utmost respect for original recipes and processing methods. 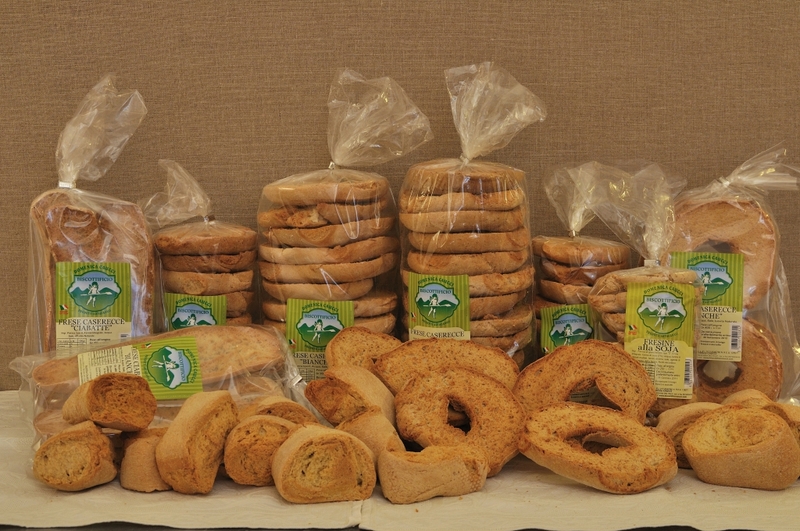 Massimiliano Falcone, current owner with Alessandro Falcone of this biscuit factory, now in its third generation, explains: «The history of our business began about 100 years ago with my grandmother’s mother, who had a small wood stove where she prepared bread and 'Scalette', typical ‘Taralli’ with their characteristic shape similar to ‘8’. 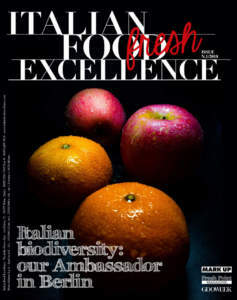 We still produce them, with the same recipe and, especially in our area, they are the products which more identify us. Over the years, the oven was run by my grandmother first, then, for about 40 years, by my mother, Domenica Caucci. This is the commitment followed by our company, as we are convinced that recreating every day both flavours and fragrances typical of an ancient land as Basilicata is, is also a cultural mission». 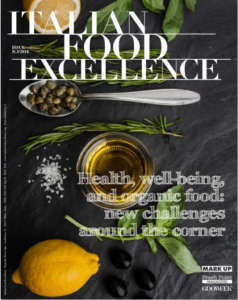 Today these products are more than ever a valuable heritage not only gastronomic, but also cultural, linked to the history of taste, flavours, and colour of their land of origin. 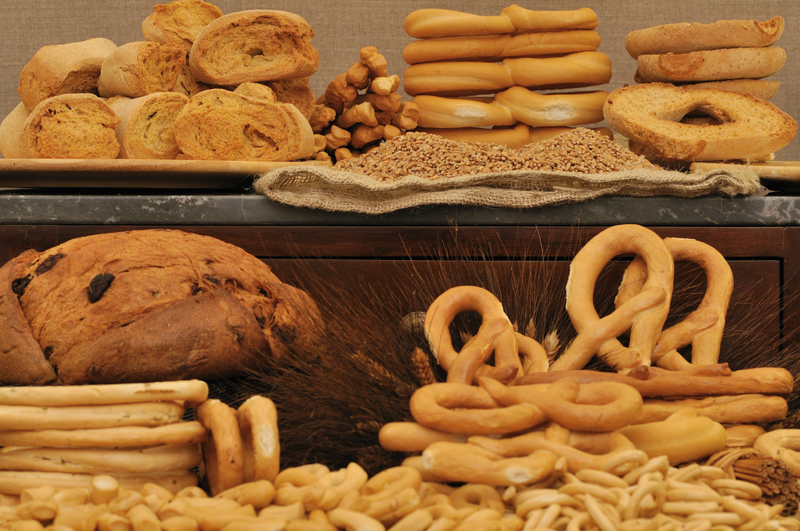 Here, genuine mixture and still artisan processing, performed by skilled and experienced master bakers, are unmistakable signs of alimentary habits which have still been preserved intact, and for which the contribution of modern technology has only the function of ensuring control quality and compliance with the health rules in force. ‘Taralli’, the flagship product of Biscottificio Domenica Caucci, distinguish themselves for the simplicity of processing. It seems that their origin dates back to the fifteenth century, when peasant families, when gathered, used to offer this food accompanied by good wine, as a sign of cordiality and friendship. There are also ‘Frese’, doughnut of toasted bread cut in half crosswise and baked a second time in warm oven. Their very ancient origins date back to the Greeks. Virgil remembers them in his verses, when Aeneas and his companions landed in Salento and brought with them their tables, precisely including ‘Frese’. In the past they were consumed by farmers instead of bread, seasoned with fresh tomatoes, oregano, and olive oil. On the other hand, today they have become a delicious and tasty meal. 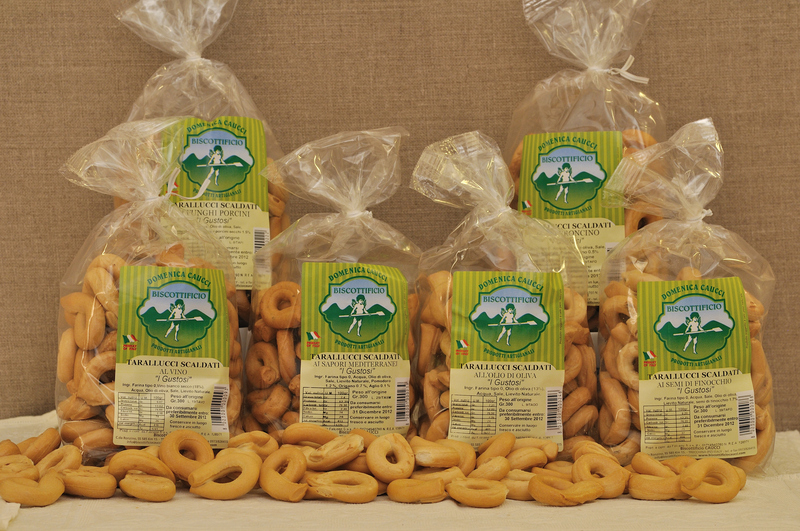 The products realized by Biscottificio Domenica Caucci are characterized by lightness, as they are produced with a low content in fats, by using only and exclusively olive oil, and, for such products as the traditional Taralli, without any fat, but only thanks to a slow rising with yeast base and a typical processing handed down over the years. 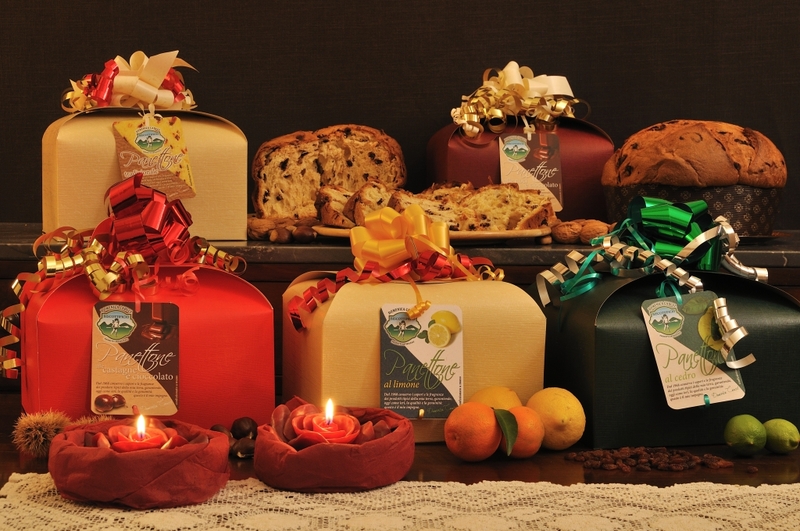 Among its sweet specialties, for Christmas Biscottificio Domenica Caucci produces artisan Panettone, with recipes which combine the great Italian tradition with the unique taste of the local essences. 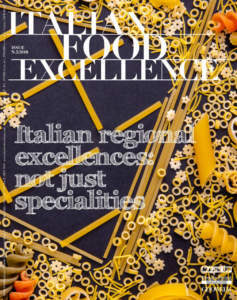 ‘Panettone alle castagne e cioccolato’, with chestnuts and chocolate, and the addition to such classic ingredients as flour, butter, sugar, egg yolk, and natural yeast, of chocolate drops, honey, salt, flavourings, natural yeast and chestnuts, «the ones of Avellino, which we get fresh and process, preparing a syrup and cooking chestnuts», as Falcone specifies. The Company also proposes ‘Panettone alle noci e cioccolato’, with chocolate drops, walnuts, and chocolate; ‘Panettone al limone’, with lemon; ‘Panettone al cedro’, with citron and the addition of diced citron to the classic dough; the traditional ‘Panettone tradizionale’ with the addition of diced orange and citron. Falcone explains: «The idea of producing Panettone comes from the fact that over Christmas time our products in the stores are replaced on the shelves in order to make room for typical Christmas products. Therefore, we said: why do not we try to occupy those spaces? ‘Panettone con le castagne’ and ‘Panettone con le noci’ were born. Later, because of the proximity of Calabria and Campania, the production of ‘Panettone con Cedro di Diamante’ and with little drops of lemon, in order to remind the flavours of the coast of Calabria and Campania», added. These are artisan Panettone, whose characteristic is their triple leavening, made with yeast base. Beyond their dark yellow colour due to butter and egg yolks, beyond their orange, green and brown stains thanks to orange, citron, chestnut, or chocolate, their large irregular holes mainly distinguish it. The processing respects the traditional criteria and, where possible, it is done by hand, in order to enhance the delicacy of raw materials.